There are lots of good hockey drills that start with the four lines at the blue lines. They are nice because you can go from one drill to the next without much down time in between drills. 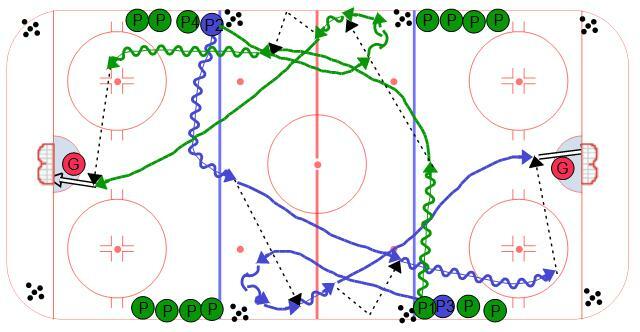 Here is another good hockey drill that uses the four lines. Two players from the diagonal corners will go at the same time. The first player will carry the puck across the ice as though they are skating around the neutral zone face off dot. The second player in line will skate straight ahead and open up to receive a pass from the other line's first player. Once this player receives the pass they step to the middle of the ice so they can chip the puck off the boards at a better angle. The player that passed the puck picks up the chip with speed and carries it into the zone. The player that chips the puck has to sprint to the far post and receive a pass back from the first player.